The scene after the arrest of Shawn Richard Christy in Ohio. 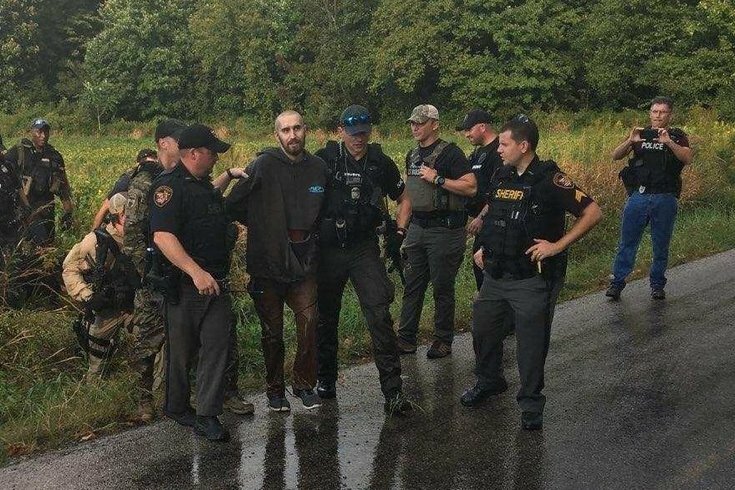 Shawn Richard Christy, the Pennsylvania man who’s eluded federal authorities since June after allegedly threatening to kill President Donald Trump and a district attorney, was arrested in Ohio on Friday, according to a statement from U.S. Marshal Robert Clark. U.S. Marshals, the FBI, the U.S. Secret Service, and numerous state and local law enforcement agencies have pursued Christy since a federal warrant was issued June 19 for his arrest. According to a press release from the U.S. Marshals Service, Christy, 27, was found hiding between some large rocks on a stream bed in a wooded area and was arrested with a knife and a .380 handgun. Christy also had multiple state arrest warrants in Pennsylvania for burglary, probation violation, and failure to appear for an aggravated assault case, according to U.S. Marshals, the FBI and the U.S. Secret Service. According to the release, Christy was taken to a local hospital for examination and will be held in custody in a local facility, pending his extradition back to Pennsylvania.